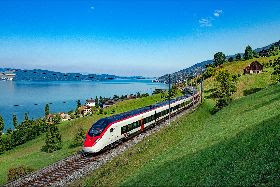 The Federal Office of Transport (FOT) has granted the new high-speed train SMILE Stadler, called by the SBB Giruno, an operating license up to 200 km / h in single traction on the Swiss network. How SBB announced today that it plans to take the Giruno early summer 2019 in stages over the operation. On April 4, 2019, the FOT has the new high-speed train Stadler SMILE granted an operating license up to 200 km / h in single traction. That clears the way for the new Gotthardzug, for the first time to communicate with passengers in the Swiss rail network. The SMILE has been successfully completed all project milestones. Since April 2017, several hundred tests were held in the four designated countries of operation – in Switzerland, Italy, Germany and Austria. The Giruno offers passengers up to 400 meters in length in double traction total of 810 seats. The trains are (76 cm) equipped with a low-floor entrances for the different platform heights in Switzerland, Austria and Italy (55 cm) and Germany. This is a first for the SBB in a one-story train set. The Giruno exceeds the requirements of the Disability Discrimination Act, it has about twice as many wheelchair-accessible seats and toilets as specified. Even otherwise, the trains can mount up with a lot of comfort: you have a good cell phone coverage on the go sockets for all seats, large overhead bins, gender-separate toilets and a modern lighting system with energy-saving LED lamps. The entire interior is designed spacious and bright. Since the end of 2016, the Gotthard Base Tunnel – the longest railway tunnel in the world – in operation. End of 2020, the Ceneri Base Tunnel completes the flat rail link through the Alps. In view of the expected increase in demand by the SBB has ordered 29 Stadler multiple units with options for up to 92 additional trains that can travel up to 250 km / h. It is eleven-part multi-system electric multiple units. Stadler has developed the new train from the contract signature in October 2014 in only 23 months and built. Three months later, the first train was put into operation. he was first presented to the public at the InnoTrans 2016 Stadler called the “SMILE”, SBB has given them the name “Giruno”, a derivative of the Romanish name for Buzzard.